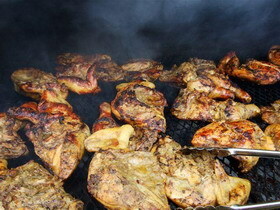 Jamaican food is fantastic, and is one of the things Jamaicans miss most when away from home. This page will introduce you to types of food from Jamaica, from our renowned jerk chicken to less famous fare like tamarind balls. Before we dive into the world of Jamaican cuisine, let me reassure you. Visitors needn't worry that they'll have to spend their holidays coping with strange dishes. There's plenty of variety, and you're sure to find lots of familiar favourites. Chicken and chips (french fries) is widely available, along with pizza and burgers. Seafood, pork, and beef can be cooked however you like them. Common side dishes are rice, macaroni and cheese, and potato salad. North American fast food franchises like KFC, Burger King, Pizza Hut and Dominoes are scattered here and there, particularly in the bigger towns. And we have great Chinese restaurants too. Restaurants in Jamaica are many and varied. Vegetarians may find their choice of entree a bit limited in rural areas, but certainly there'll be no lack of fresh fruits and vegetables. Here is an introduction to food from Jamaica. After careful thought, and feedback from both local and foreign friends, the suggestions for not-to-be missed, you-got-to try-this Jamaican food are listed first. Get out there and start eating! Other popular main dishes: Fried, Baked, Stewed and Curried Chicken, Stew Peas, Oxtail, Curry Goat, Cow Foot, Tripe and Beans, Pepper Steak, Stewed Beef and Pork. Other local side dishes: Yam, green bananas, breadfriut, dasheen, coco, potato, sweet potato, boiled dumplings. Other Jamaica-grown fruit: June (Jew) plum, guava, naseberry, sweetsop, soursop, tamarind, tangerine, ortanique, guinep, pineapple, starapple, watermelon, grapefruit, coolie plum, hogplum. Other Jamaican desserts and baked goodies: Bread pudding, banana bread, Christmas cake, Easter bun, bulla, toto, plantain tart, banana fritters. Other popular Jamaican drinks: Fruit Punch, Red Stripe Beer, Cherry Juice, June Plum Juice, Ginger Wine, Tamarind Drink, Soursop Drink. Other Jamaican soups: Mannish Water, Fish Tea, Cow Cod, Pepperpot, Pumpkin, Chicken/Chicken Foot, Beef. Other Jamaican snacks and sweets: Plantain Chips, Plantain Tarts, Cassava Chips, Asham, Busta Backbone, Coconut Drops, Grater Cake, Blue Drawers, Icy Mint. We found that we couldn't fit our irreplaceable Patty and Coco Bread into one category - these two won the title of Jamaica's Most Popular Food Combo. Is that enough to get you started? Who knows, if you eat enough of our food, you may find soon find that you catch the Jamaican accent as well!